Quad Eye Shadow contains the advanced, stay-put formulas that blend effortlessly to bring your eyes out beautifully, without overshadowing. The 4-kit collections of great shades are hand-picked by makeup professionals. Cover Girl Eye Enhancers Trio 3 Kit Shadows blend effortlessly to bring your eyes out beautifully, without overshadowing. Created with advanced, stay-put formulas, these collections of great shades are hand-picked by our make-up pros. Designed for a classic and natural eye makeup look. Each one lets you mix and mingle, or just use a single shadow. 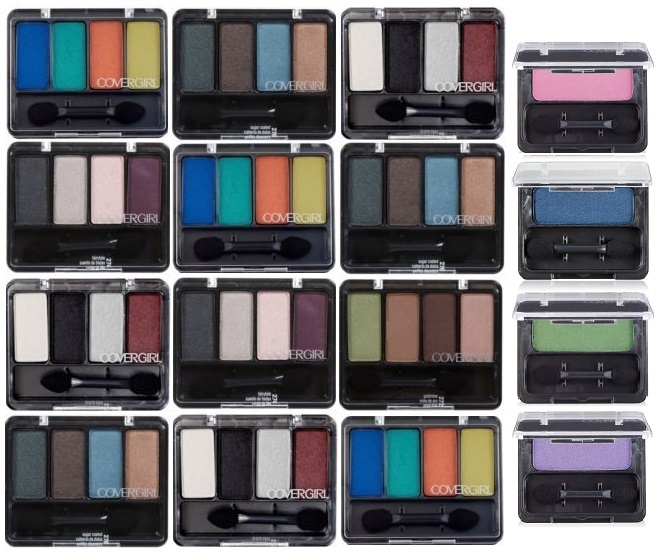 1-kit Eye Enhancer eye shadows are simple, single shades with a formula that lasts for hours. Mix and match them the way you want to create your own combos with matte, pearly or sparkly shades! They blend easily to let the natural beauty of your eyes come through.